Density refers to the mass contained within a unit volume under specified conditions. Data given here refer to the solid. 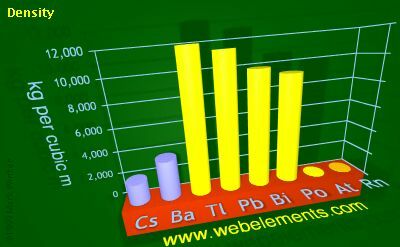 Density is temperature dependent and different allotopes of one element possess different densities. Where possible, values are given at or near ambient temperature, hopefully of the thermodynamically most favoured allotrope. Image showing periodicity of density of solid for 6s and 6p chemical elements. The preferred units are kg m-3 because the basic SI unit of weight is the kilogramme (kg) and the preferred unit of length is the metre (m). To convert to the commonly used units of g cm-3, divide by 1000.